The AVPlayerItemHomeOutput lets you coordinate the output of content associated with your HomeKit lightbulbs. Works with all HomeKit (and HomeBridge) compatible lightbulbs. let sample = URL(string: "https://raw.githubusercontent.com/bower-media-samples/big-buck-bunny-1080p-30s/master/video.mp4")! homeOutput.setDelegate(self, queue: nil) // Optional AVPlayerItemOutputPullDelegate. playerItem.add(homeOutput) // ...and add it to your AVPlayerItem! Add NSHomeKitUsageDescription key to your Info.plist to specify the use of HomeKit in your app. 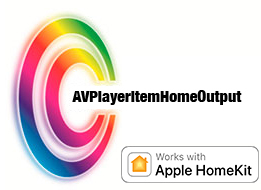 AVPlayerItemHomeOutput is available under the MIT license. See the LICENSE file for more info.